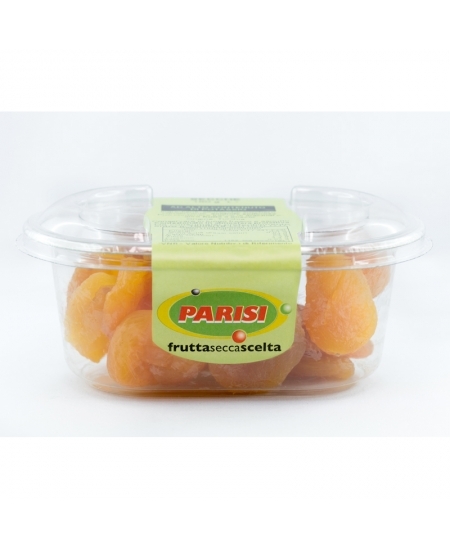 Home > Dried Fruit>Albicocche secche - 180 gr - Parisi s.p.a. It is a very popular summer fruit because it has a sweet taste but also a little acidity that is good for being eaten alone or with other salted foods. It is a source of iron and vitamin A, which contributes to the maintenance of normal visual abilities. 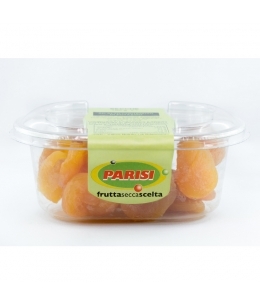 Apricot is the fruit of the apricot tree, its cultivation originates in the northeastern China regions and was imported into Italy at the time of Roman times, from Greece. Apricot has a yellow-orange color, depending on the variety, with slight red tones and velvety skin and fleshy meat. It is a very popular summer fruit because it has a sweet taste but also a little acidity that is good for being eaten alone or with other salted foods. Inside, it has an edible almond-shaped seed protected by a bone part. The main producing countries of this tasty fruit are Turkey, Russia, Spain, Italy and the United States. In Italy Albicotta is produced mainly in the southern regions. Through the conquests of Alexander the Great, he came to the Mediterranean regions. Apricot was known and loved by ancient Greeks and was considered by the ancient Romans as a rare and exotic fruit, source of iron and vitamin A, which contributes to the maintenance of normal visual abilities.